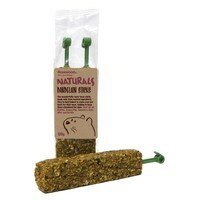 Rosewood Naturals Dandelion Sticks offer small animals two delicious treat sticks, bursting with natural ingredients. These yummy dandelion sticks provide a wholesome snack as well as vital mental stimulation. Your small pet can enjoy hours nibbling away at this hard baked treat. Enriched with dandelion, these treat sticks are simply irresistible to small animals and offer a great supplement to a well-balanced diet.